The event was held on Tuesday, April 12, 2016 in Kohler’s private airline hangar at N6200 Resource Drive, Sheboygan Falls WI 53085. Both Gard and Ryan have been awarded Coach of The Year titles – Bo Ryan for the 2007 Clair Bee Coach of the Year plus Big Ten Coach of the Year for 2002, 2003, 2013 and 2015 and Greg Gard for the 2016 Jim Phelan National Coach of the Year. Ryan is scheduled to be inducted into the Wisconsin Sports Hall of Fame on April 30, 2016. 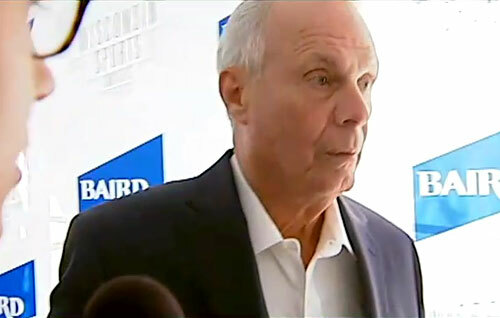 Bo Ryan was the head coach of the University of Wisconsin–Madison Badgers men’s basketball team from 2001 to December 2015. Ryan served as the head men’s basketball coach at the University of Wisconsin–Platteville from 1984 to 1999 and at the University of Wisconsin–Milwaukee from 1999 to 2001. On December 15, 2015, Ryan announced his retirement, effective immediately. Sports Speakers 360 is a booking agent for pro athletes. If you would like to book Bo Ryan for a speaking engagement, appearance or endorsement, contact a Bo Ryan booking agent for fees at 1.855.303.5450.